This sweet S-Series Valiant was put together as a father/son effort by Phil and Mike Roycroft from Perth. They must know what they’re doing, as it went together pretty quickly, taking around a year from go to whoa. Of course, it helps if your son has inherited the Mopar madness and has an old Valiant or two lying around, and, as Mike was so involved in the build, who better to tell the car’s story? I’ll let him take it from here. “My dad has always had a fascination with this particular model, ever since he was young. He has owned lots of different Valiants as daily drivers over the years, but has never managed to own an S-Series. Once he retired, he decided it was time to buy himself a little toy, and while he considered a few different cars, the main criterion was simply that it had to be a Chrysler product. When it all came down to it though, he just had to get himself an S-Series. “I was initially not too thrilled about his model choice, much preferring him to pick up something a little later or perhaps a VH-VJ hardtop. But the car was to be exactly what he wanted, and I knew that with the right build, any car can be nice. So, an S-Series it was. “Over the years, between us we have built up a fair bit of experience finding Valiants, always having a sharp eye on Gumtree and eBay for ‘bargains’ – much to the dismay of my mother – most of them being projects of my own. 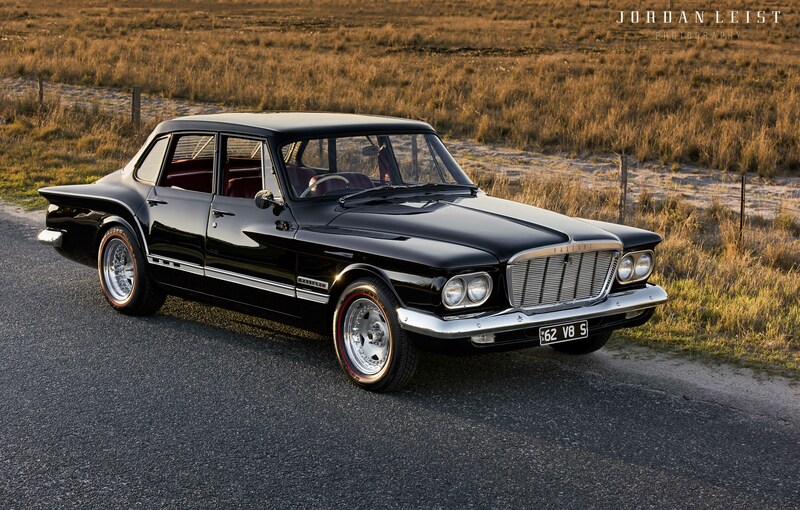 A few cars sparked Dad’s interest, in a variety of price ranges, but as an avid TAVO (Tight Arsed Valiant Owner) he is always partial to a bargain, and one particular car in Adelaide just seemed to stand out from the rest. “It was a white S-Series with blue trim and a 318 V8 installed, sitting proudly on 1980s-spec Hotwires. This car looked like a great buy to Dad, only needing a few small things to be done. The deciding factor was the 318 in place of the regular 225 slant-six – he really craved that V8 rumble. The icing on the cake was the price; about half the price of any other S-Series advertised anywhere, it appeared to be an absolute bargain to any true TAVO, too good to pass up. A few days later, Dad excitedly messaged me saying he’d won the S-Series auction and that it would be arriving in Perth the following week via train! “After Dad trailered it back to his house, I went over for my first look. Initially the car looked good, but there were quite a few things needing attention. It had previously run on LPG at some stage (with a nice defunct filler neck spouting through the quarter panel) and on inspection the little Chrysler small-block was looking very, very tired: rust water leaking through the Welch plugs, some major oil leaks, and the engine bay itself in a very poor state of affairs. After about an hour of me tinkering, the car fired into life, but was barely running on seven cylinders. It wasn’t exactly living up to expectations. “Our initial plan had been to pull the engine out for a freshen-up; smooth, paint and detail the engine bay; freshen up the trim; and swap out the wheels for something a little nicer. But after giving the car a thorough going-over and noticing lots of small issues with the body, it became apparent there was only one way to approach the build. This was Dad’s first modified car and he wanted to keep it until the end of his days, so we decided to strip it right back and rebuild everything properly so we could have a car to be proud of. “We pulled the engine and trans and Dad began stripping all the glass, wiring, chrome trim and interior ready for the Val’s big birthday. Unique Auto Refinishers handled the panel and paint, getting the body to a presentable shape, filling all the redundant holes in the engine bay, and, most importantly, getting rid of the pesky LPG filler in the quarter panel. “After a bit of persuasion on my part, Dad chose at the last minute to deviate from standard white with blue and change the colour to straight black, complemented by the dash and door frames in candy red to tie in with the planned new interior. Looking back now, Dad always comments that he’s so glad he painted it black; it really does look like a whole new car. “While the car was in the panel shop, the 318 was dropped off to Chris Michel with a bunch of important parts to breathe some life into it. Nothing too wild – compression, carby and cam – just enough to make it a neat cruiser with a good rumble. Once assembled, the engine block and heads received the same candy red paint as the interior. A host of stainless braid replaced the standard rubber stuff, and the engine bay received a basic tidy-up, with the battery relocated to the boot and the wiring hidden. The car was then sent to George at Blown Motorsports for a carby tune on the dyno. Now it goes very well, with great street manners. “My friend Rob Sellen then worked his magic on the interior. The original bench seat was ditched in favour of some NL Fairlane buckets with the headrests removed, and the rear seat was re-bolstered to mimic the front seats. It looks great. Rob finished things off with a hand-formed carpet, complete with red piping much like the originals. The interior looks simple but ties in well with the classic look in the car; it’s just a bit modernised in places. Original SV1 radios are ridiculously expensive, so to fill the hole in the dash, a RetroSound MP3 unit was installed. It fits perfectly and has actually been confused with the original unit many times by passengers. The parcel shelf contains hidden Pioneer 6x9s to tie in with the theme. And back to me. Yep, all in all it’s a pretty straightforward build, but check out how nice it turned out. You don’t see too many of these things on the road anymore, but there were never that many in the first place, so it’s great to know that this one will be cruising for years to come.